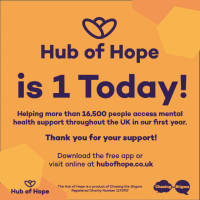 The UK’s first ever comprehensive national mental health database, the Hub of Hope on THURSDAY 5THJULY celebrated helping more than 16,500 people in its first year and fast becoming the UK’s go to signposting tool for mental health support. The app – created by mental health charity Chasing the Stigma (CTS)– has been accessed by 16,531 unique users since its launch in 2017, signposting them to the nearest and most relevant mental health support service from its database of more than 1,200 national and grassroots organisations. To date, it has received visits from users in 1,016 different cities and towns across 79 countries, with the highest number of visits coming from London, followed by Liverpool, Manchester, Birmingham and Leeds. Almost 67% of users accessing the Hub of Hope are female, with 33% of visits coming from men. The exponential growth of the app and its ease of use has led to its adoption as a signposting tool by phone advisors on Papyrus’ Hopeline, as part of the Zero Suicide Alliance’s acclaimed ‘See Say Signpost’ training and by emergency services across the country. User and service provider feedback collected over the past 12 months has revealed that the app is frequently being used as a vital stopgap for the thousands of people on the five to six-month NHS waiting list for mental health referrals and traffic from national charities Mind and Samaritans is also significantly increasing. Chasing the Stigma CEO, Jake Mills, said: “It really has been an incredible first year for the Hub of Hope. I started out with an idea, a vision for the kind of tool that would have helped me before my own suicide attempt almost five years ago. “To see how successful it has become by its first birthday is absolutely fantastic and I’ve been overwhelmed by the support it has received from mental health support services across the country, small and large alike. The gruelling ten kilometre obstacle course was completed by a team of six, made up of Jake, trustees, friends and supporters of Chasing the Stigma, in just over two hours, raising more than £1,000 for the organisation.